Home » The Christian Spirit » Halfway Christians? Any endeavor for God can start out with the best of motives and still go wrong eventually. I have a prime example from Puritan history. 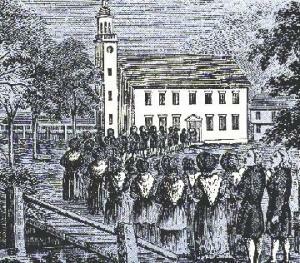 If you’ve been following my posts on the unfolding of American history, you may remember that when the Puritans migrated and set up Massachusetts, they had a rule that only church members could vote. It seemed reasonable at the time, especially since they wanted to maintain the Christian commitment that inspired their journey. Three decades later they had to face up to a problem with that rule. How they resolved it was a giant step backward. This is where their theology got in their way. As devoted Calvinists, they didn’t believe it was up to man to choose to follow Christ; it was God’s choice, and only He could give that assurance. Many were faithful to the outward manifestations of the faith and probably thought they were right before God, but without the inward assurance, they couldn’t join the church. This raised another theological issue. The Puritans believed in infant baptism, and that the baptism was a way of bringing the children into the covenant community. If the parents weren’t church members, then their children couldn’t be baptized, therefore placing them outside of the protection of God’s covenant with His people. What to do? Well, here’s what they decided. They allowed these church attenders who hadn’t received God’s assurance of salvation to be partial members of the church. This was called the Halfway Covenant, passed in 1662. What did it mean? As a partial member, one could have his children baptized and could vote. Other things, though, such as communion, were not allowed. This seemed to solve those two problems: now the children were under God’s protection and there would be more voters, thereby reducing any resentment that might arise from property owners who couldn’t take part in choosing their political leaders. But was this really a solution? 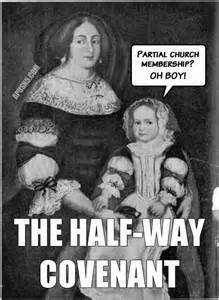 Where, in the Bible, does one find reference to halfway Christians? I already am opposed to the theology that says man doesn’t choose to follow God, but this Halfway Covenant made things even worse. The message of salvation was now watered down to include, perhaps, those who never had any assurance of being one of the saved. I believe this hastened the Puritan community’s slide into a loss of spiritual fervor and seriously undermined their original intent of setting up a model of a Christian community for Old England to follow. In my view, the Halfway Covenant was a drastic departure from Biblical truth, and the consequences of that departure were ultimately disastrous for a generation’s understanding of salvation through Christ. No one today has officially set up some type of Halfway Covenant, but don’t we do the same thing anytime we talk about “nominal” Christians? My reading of Scripture doesn’t permit me to think that a person can be half a Christian. We are either devoted to God through Christ—and our whole lives are built on that relationship—or we are outside the kingdom. We are, to a greater extent than I would ever hope to see, another generation that has lost its way with a watered-down salvation message.